Temrezov: the volume of agricultural production in the KCR for five years has grown by almost 10%. 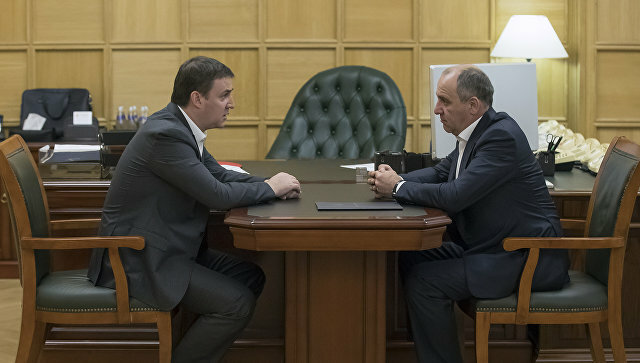 The volume of agricultural production in Karachay-Cherkessia in the five years grew by nearly 10% and exceeded 32 billion rubles, said the head of the Republic Rashid Temrezov in his Instagram after the meeting with the Minister of agriculture of Russia Dmitry Patrushev. At the meeting the sides discussed the pace of development of the agroindustrial complex of the region, and implementing economically and socially significant investment projects in agriculture of Karachay-Cherkessia. "The Minister positively assessed the dynamics of agricultural output in the Republic, whose share in the gross regional product is growing every year. Compared to 2013 the volume of agricultural production in Karachay-Cherkessia has increased by almost 10% and amounted to 32.3 billion rubles," — wrote in Instagram Temrezov. He added that a separate topic of discussion was the development of horticulture in Karachay-Cherkessia. "Until the end of the current year the total area which will be planted gardens, will be 600 hectares. Special attention is given the project of growing the pear garden, the only garden of this volume in the Russian Federation", — said Temrezov. According to Temrezov, the Ministry of agriculture of Russia is ready to provide further measures of state support of agriculture of the Republic, special attention will be given to small businesses. In addition, the Federal Ministry will continue to support the region through the programme "Sustainable development of rural territories", which aimed at the construction of social and engineering infrastructure in rural areas.